When students hear the term “resource”, they may begin to think of natural resources, which make up only a part of the economy. Begin this intro to economic lesson plan by asking students the following questions. What does an individual need to survive? How do individuals obtain the things they need to survive? What does society as a whole need to survive? As students answer the questions in this economics lesson plan, write the word “Resources” at the top of the board. Below this, write the words (with plenty of space between them) “Land”, “Labor” and “Capital”. Draw a line from “Resources” to each of the other words. As students answer the questions, write their answers under the appropriate term. 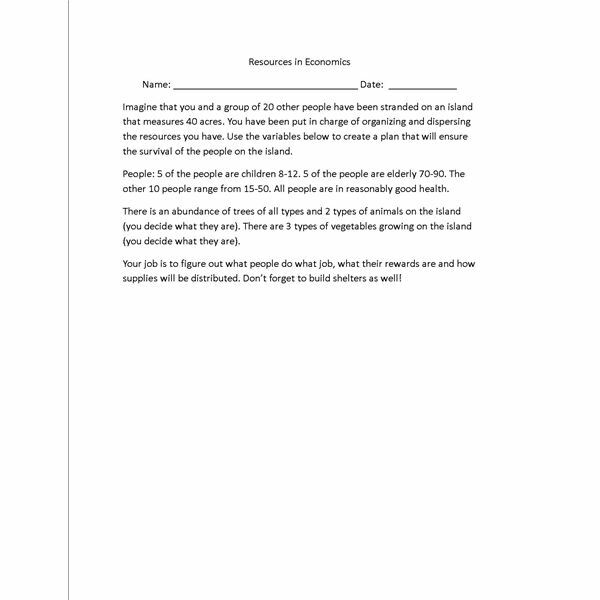 Explain to students that economic resources are divided into three groups. Name those groups as land, capital and labor. Move on to the next section of the leconomics lesson plan. Economics lesson plans often use grouping to explain simple economics concepts.To explain how the items are grouped into particular categories, use the terms and explanations listed below. Land– This includes all natural resources, whether they be food, mineral, jewels or acreage. All things that are preexisting on Earth without the interference of man are put into this category. That is not to say that man does not have to help renew these resources, but they would be here if man did not use them up. Labor– Labor is a resource provided solely by man whether it is in the form of physical or mental labor that man provides. For instance, there may be fruits they grow on trees, but man has to pick them and man has to come up with the idea to pick and consume them. Capital– Capital is any resource that helps us to provide some type of product or service. From the pencil that you use to the school you use it in, these are capital resources. Review this information with your students and answer any questions they have. Provide students with specific examples of resources and ask them to come up with their own examples, then come to the board and write them in the appropriate category. It’s even feasible to make a game of creating and listing ideas for resources. Students may actually have fun in their economics class if they get to play a game as they learn! Finish this intro to economics lesson plan off by handing out the included worksheet and asking students to complete it. As they complete the worksheet, they should categorize their resources and uses for them in the appropriate categories. The worksheet should be completed within 1-2 pages. This series is aimed at introducing students to economics using hands on lesson plans and activities to ciltivate interest and understanding about the basic concept of economics.